A new look for Ping’s G-series, but performance backs up the design. Offers a very stable ball flight with a powerful impact sensation. Better players may want a smaller head. Drawing on inspiration from plane wings and cycling helmets, the Ping G30 driver features so-called ‘turbulators’ on top of the crown. They are designed to improve the club’s aerodynamics and cut drag, increasing clubhead speed for more distance. Ping says wind tunnel testing has shown a reduction in drag at a variety of swing speeds, with 1mph of clubhead speed equating to an extra 2-3 yards of carry for average golfers. Turbulators also aid alignment, by drawing your eyes into the back of the ball. 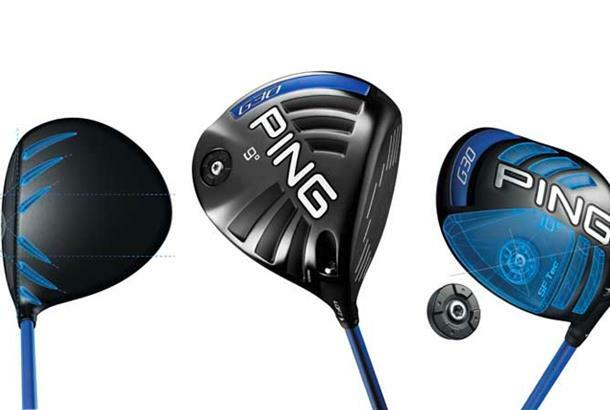 Ping’s G series has been around for more than a decade now, and this new G30 family is the most advanced yet. The range has always been aimed at the club golfer seeking maximum distance and forgiveness in drivers, fairways, hybrids and irons. That’s still the case, but it's fair to say this new driver looks nothing like any of the G drivers that have come before. Elsewhere, stronger titanium in the clubface allowed designers to make it thinner, and move the weight saved to raise head stability, while sole ‘louvers’ thin the walls to improve the sound, save weight and optimise the centre of gravity position. The G30 driver’s centre of gravity is the lowest and furthest back of any Ping driver, ever. The “SF-Tec” version has a lighter swing weight and the Custom Tuning Port positioned more toward the heel to create more draw bias, encouraging the clubface to close faster in the downswing to help slicers square the face. It also has a face angle that is half a degree closed compared to the standard model but maintains the minimal offset of the standard version. Ping has also increased the amount of adjustability. You can now add or subtract 0.6° or 1° of loft from the two heads on offer to fine tune your ball flight. The CTP also has a greater range of weights to accommodate a wider range of aftermarket shafts to optimise the G30 driver’s swingweight. The TFC 419D shaft has ‘high-balance-point technology’. That means the shaft’s centre of gravity is closer to the grip, allowing for a heavier clubhead which increases ball speed and MOI and contributes to the extremely low CG location. We talked to Ping's Marty Jertson, Director of Product Development, about the G30 driver and the turbulators - watch the video here. Lack of central alignment aid and the turbulators take some getting used to, but they do draw your eye towards the centre of the face. Classy matt crown as always. Firm and fast off the face, doesn’t feel like much gets left behind. The sound is pleasingly powerful, like the G25, if slightly more muted. Top of its class. The SF-Tec version, while not a unique concept in drivers, is yet another way slicers can reduce the curvature of their flight. Golfers who need more loft get it via the enhanced adjustability and achieve more distance than G25 when factoring in the turbulators. Only really poor strikes reduce ball speed significantly and when you don’t quite strike it, distance is still impressive. Stability at impact is one of this club’s strongest traits. There really is nothing to dislike on the G30. The look at address may divide opinion initially, but that’s soon forgotten once you swing it. On average, with the same spec shaft and loft, G30 gave me 3mph more ball speed than G25. The numbers really do speak for themselves. In only its second month on the market, the PING G30 driver achieved the Number 1 sales position for units and dollars in the on- and off-course retail channels combined for the month of September in the United States and the United Kingdom, according to Golf Datatech LLC, which tracks golf equipment sell-thru data for both regions. Since its launch, demand for the driver has reached unprecedented levels for the company throughout the world as golfers realize increased clubhead and ball speeds, leading to more distance. The G30 driver also features the highest MOI of any PING driver ever designed to ensure golfers the accuracy and consistency to hit more fairways. Tour acceptance has also been swift, with the majority of PING’s staff converting to the new G30 driver immediately. Angel Cabrera won The Greenbrier Classic the first week the driver was on the PGA Tour. Bubba Watson also put the G30 driver in his bag that same week. He finished the PGA Tour season # 1 in driving distance with an average of 314.3 yards, including launching the longest drive of the season – 424 yards – at the Bridgestone Invitational. He increased his clubhead speed by 2 mph and ball speed by 4 mph – leading to a 10-yard distance gain during testing. Billy Horschel’s switch to the new driver gained him 12 yards off the tee and played a big role in helping him win the FedExCup. After putting the G30 driver in his bag, he won twice, finished second and earned more than $13.4 million. I found it quite difficult to hit off-centre, which is never a bad thing. The larger head makes the shaft feel shorter, which boosts confidence and control. I got more optimum spin rates for my swing speed with the LS-Tec, something that will apply to most fast swingers. At address, the Turbulators draw my eye towards the centre of the face. The sound is a little tinny and high pitched. The shaft feels short, which helped my control of the face. Using the LS-Tec with more loft helped me achieve more distance. I love the forgiveness you get from a low-spinning head. I’m not someone that likes to shape the ball too much, so the stable flight means it’s a strong candidate to go in my bag. I have 10.5 g30 with a Bi-matrix shaft 1/2 inch shorter. Great driver, performs well on off centre hits, tested ls tec before buying which is longer but I like the drop and stop I get from high launch on the standard G30. It's Ping so good quality and does what it says, only reservation is the black face, like all of them it shows signs of wear you wouldn't get with silver. Replaced a Taylor Made RBZ driver with my G30, very easy to line up, extremely forgiving, slightly more yards in length, essentially more accurate. Great Driver! After a Ping demo for the G30sft I purchased one. Best thing I've ever done, its brilliant, its one great badboy. A senior long hitter being newly matched by colleagues, time to update my driver. Cue American Golf truck visit fI have nowitting session, a plethora of different drivers, careful analysis by the expert of my swing and voila, the Ping G30 SFT TFC. Immediately felt comfortable in my hands, generated a smooth controllable swing, fins helped frame the centre, my slight fade corrected to a long straight drive - lovely. Now fully confident from off the tee. Has added (truly) another 20 yards Yahoo!! My pro told me to flick my wrists on impact but i did this and turned it over and drew the ball . still coming to terms with the dynamis of theclub but enjoying it all the same. Superb Driver looks awesome was fitted for mine which is the way to go the Pro was very patient and I brought the club SF TEC with Tour 65 shaft going away thinking I,ve cracked it. First time out was a revelation hit this so bad next time out a little better but still not the best so back I went to the Pro changed the shaft to the stock Blue Shaft TFC 419 Now hitting it great. So was worth trying again. But lie any other club a great club wont correct a bad swing. You have to try it to believe it. The club with SF Tec does exactly what everyone wants a driver to do. Long, straight and incredibly forgiving. Now I can go for the green with my second shot . Thank you Ping Regards Bob. Offers a light, balanced feel that made control of the face simpler to achieve. The draw bias helped tighten my dispersion. The turbulators actually aid alignment and look quite cool. More club speed along with extra draw bias helped its performance. While I couldn’t get the top distances others were getting, I enjoyed the feel and incredible accuracy. After trying out the R15 and the Callaway Big Bertha with disappointing results, the fitter at Gloucester golf centre in Barnwood got me to try the Ping G30 SF with immediate results. With tight dispersion and great length, it was a no brainer. I paid £ 239 for the club, way cheaper than the other two models and went off to play. I've been out twice now and the second time at Forest hills in Coleford, it really started to work like a dream. If like me you have stopped using a driver due to poor control, then I would recomend you give this club a try and start enjoying smashing the ball down the fairway far and straight. Recently purchased the G30 SFTech in an attempt to gain yards & banish my slice, I had played with the Adams Speedline F11 draw, the Nike Machspeed draw, and most recently the Ping G 15 draw, all assisted in stopping the slice & the Ping was the most effective, BUT all produced some shocking dragged drives to the left. I have played 6 rounds with the G30, I have duffed a couple of drives by playing the ball too close to the heel, but no word of a lie, my confidence has grown with each round played, I am teeing a little higher, setting up with the ball off centre towards the toe & the results are brilliant. At best in summer with good run on the fairway I might have made 180 yards, currently in cold conditions & with fairways offering no run I am at 210 yards consistently, havent missed a fairway in the last 5 rounds, have found some bunkers that were never in my previously in my range, I am 10 shots better since moving to the G30 mainly due to playing my 2nd shot from the fairway rather than the deep rough or adjacent fairway. Before the sceptics get stuck in, I hit my irons straight, my fairway woods with only a slight left to right, I have had lessons but put me on the tee with a driver and it was any bodies guess.... well not any more, cant wait for better weather I have got 250 yards middle of the fairway expectations. I,m left-handed and struggled to find the new g30 in my area there was a ping demo day at lochwinnoch golf club and club pro Gerry Reilly very kindly squeezed me in at short notice. This new offering from ping is very impressive, i spent 45 minutes with ping rep Gordon Niven trying out all the variations on shaft and loft, got great figures and consistency loved club and also look of it, go as far as to say best ping driver i,ve hit.I was so impressed bought club there and then from the pro Gerry and just to finish a wee plug for the course lochwinnoch it looks in immaculate condition for time of year and is well worth a go, i,m planning a game next week and course is 60 miles from where i live check it out, green fees this time of year are very reasonable and on full course still. Just bought a.g30 ,what a driver gained a extra 10 -15 yards . love it, might go to my local shop and try the g30 irons,if as good as the driver I will buy them. Went up to Gainsborough on Tuesday 5th August to have my fitting, brilliant staff up there. The clubs arrived at the Warren Golf Club yesterday and I went straight to the driving range. I cannot explain the joy I had when I went through the bag, every club went as straight as an arrow and the distance was more or less the same as my Taylor-made's using the range balls but the big difference was the staightness. I visited my home club at Hintlesham this morning and although I pared the first four holes I was not hitting the ball solid off the tee, then I made a small adjustment in my stance and hammered it on the remaining holes, I shot a 77 which is one under for my handicap and this was my first round with these clubs. I cannot wait until Sunday when I am playing a Charity match at Five Lakes, these clubs will only get better as I get the hang of them. I recommend anyone buying Ping to have a trip to Gainsborough and get fitted, you will not be dissapointed. Took no time to adjust to this club find the results was more than I would have wished for. Went out and played twice to find it was apleasure to move to the g30.